i'ven't been this worked up about a recipe in a while. Excited to the level that I look for myself going out of my way to inform friends and family about "this phenomenal chocolate dessert I made last week..."
I'd like to backup very first. Last week had been Husband Peter's birthday. Annually we make him a chocolate dessert with chocolate frosting, plus days gone by it certainly is already been of the Duncan Hines variety. We even blogged about it twelve months. But in 2010, fate, in the form of your blog Eat Live Run, handed me this recipe for buttermilk chocolate cupcakes just a couple times before Peter's birthday celebration. Bye-bye, Duncan. Needless to say, I didn't would you like to let you down Peter on his birthday, and so I made a small test group of six cupcakes very first, simply to verify he would enjoy it. It took every ounce of self-discipline in me personally to not ever eat all six of those cupcakes before Peter even got home from work. These were wet and rich and they almost melted in your lips. Peter accepted. The very next day we doubled the meal making it in 2 nine-inch round pans for a dual level dessert. Peter requested a fudge frosting, so I turned to a Ghirardelli chocolate cookbook my pal had gotten for me personally from bay area a few years ago. This frosting is wealthy, yet smooth and light. It's addicting if you are like me and now have no shame about licking frosting directly off a spatula. we splurged and bought Ghirardelli milk chocolate chips for an unnecessary, but exemplary, topping. They may be larger than regular chocolate potato chips, that we think makes this cake look extra fancy. I really utilized two levels of frosting. The first level effortlessly scatter and dripped itself all over the cake in a thin, smooth level. Evidently it wasn't very cool enough. I refrigerated it for a few hours, brought it up to room temperature and included more to the top of the dessert. For me, you can easily not have an adequate amount of this frosting. Remember if the cupcakes tested my self-discipline? The dessert, frosting, chocolate potato chips and all, almost damaged any semblance of it. If you value chocolate, could melt when you taste it. I won't be going back to cake blend anytime soon, specifically since this had been nearly as simple. 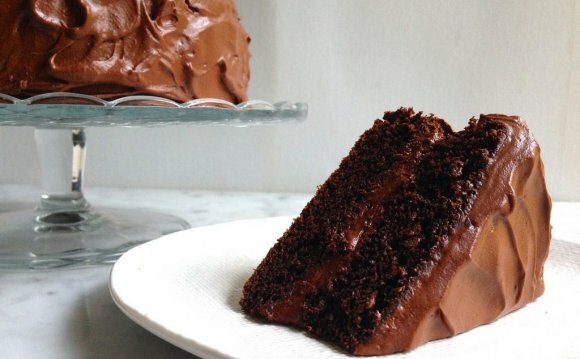 Buttermilk Chocolate Cake: Double this dish and bake in two 9-inch round cake pans. Unless you have buttermilk, merely add white vinegar to milk with a ratio of 1 tsp vinegar to 1 cup milk. Allow sit for 5 minutes before adding to recipe. When dessert is cooled, spread frosting (below) using one level, top with 2nd level and frost whole dessert, sealing into the levels. Top with milk chocolate potato chips. Melt the sliced chocolate within the top of a double boiler or in a heatproof bowl over barely simmering liquid, stirring occasionaly until smooth. Instead, melt it within the microwave, stirring every 15 seconds until smooth. Heat the ointment until hot. Pull from temperature and whisk in the chocolate. Transfer to a bowl and cool to just hot. Whisk in butter until smooth. Let sit until it reaches a spreading persistence, about an hour, or cool in refrigerator until willing to make use of, taking to room temperature before dispersing.